The Asian tiger mosquito is about 2 to 10 mm length with a striking white and black pattern. The variation of the body size in adult mosquitoes depends on the density of the larval population and food supply within the breeding water. Since these circumstances are seldom optimal, the average body size of adult mosquitoes is considerably smaller than 10 mm. For example, the average length of the abdomen was calculated to be 2.63 mm, the wings 2.7 mm, and the proboscis 1.88 mm through a study of 10 images from 1962 of both male and female mosquitoes. The males are roughly 20% smaller than the females, but they are morphologically very similar. However, as in all mosquito species, the antennae of the males in comparison to the females are noticeably bushier and contain auditory receptors to detect the characteristic whine of the female. The maxillary palps of the males are also longer than their proboscises whereas the females’ maxillary palps are much shorter. (This is typical for the males of the Culicinae.) In addition, the tarsus of the hind legs of the males is more silvery. Tarsomere IV is roughly three-quarters silver in the males whereas the females’ is only about 60% silver. The other characteristics do not differentiate between sexes. A single silvery-white line of tight scales begins between the eyes and continues down the dorsal side of the thorax. This characteristic marking is the easiest and surest way to identify the Asian tiger mosquito. The proboscis is dark colored, the upper surface of the end segment of the palps is covered in silvery scales, and the labium does not feature a light line on its underside. The compound eyes are distinctly separated from one another. The scutum, the dorsal portion of an insect’s thoracic segment, is black alongside the characteristic white midline. On the side of the thorax, the scutellum, and the abdomen there are numerous spots covered in white-silvery scales. Such white-silvery scales can also be found on the tarsus, particularly on the hind legs that are commonly suspended in the air. The base of tarsomere I through IV has a ring of white scales, creating the appearance of white and black rings. On the fore legs and middle legs, only the first three tarsomeres have the ring of white scales whereas tarsomere V on the hind legs is completely white. The femur of each leg is also black with white scales on the end of the “knee”. The femurs of the middle legs do not feature a silver line on the base of the upper side, whereas, the femurs on the hind legs have short white lines on base of the upper side. The tibias are black on the base and have no white scales. The terga on segments II through VI of the abdomen are dark and have an almost triangular silvery-white marking on the base that is not aligned with the silvery bands of scales on the ventral side of the abdomen. The triangular marking and the silvery band are only aligned on abdominal segment VII. The transparent wings have white spots on the base of the Costas. With older mosquito specimens, the scales could be partially worn off making the previously mentioned characteristics not stand out as much. The typical Aedes albopictus individual has a length of about 2 to 10mm. As with other members of the mosquito family, the female is equipped with an elongated proboscis that she uses to collect blood to feed her eggs. The Asian tiger mosquito has a rapid bite that allows it to escape most attempts by people to swat it. By contrast the male member of the species primarily feeds on nectar. The female lays her eggs near water; not directly into it as other mosquitoes do, but typically near a stagnant pool. However, any open container containing water will suffice for larvae development, even with less than an ounce of water in. It can also breed in running water, so stagnant pools of water are not its only breeding sites. It has a short flight range (less than 200 m), so breeding sites are likely to be close to where this mosquito is found. Identifying tiger mosquitoes can seem easy with the above description, but many people mistakenly identify it. The best way to be sure is to compare the specimen with several approved pictures of the tiger mosquito. Like other mosquito species, only the females require a blood meal to develop their eggs. Apart from that, they feed on nectar and other sweet plant juices just as the males do. In regards to host location, carbon dioxide and organic substances produced from the host, humidity, and optical recognition play important roles. The search for a host takes place in two phases. First, the mosquito exhibits a nonspecific searching behavior until it perceives host stimulants, whereupon it secondly takes a targeted approach. For catching tiger mosquitoes with special traps, carbon dioxide and a combination of chemicals that naturally occur in human skin (fatty acids, ammonia, and lactic acid) are the most attractive. The Asian tiger mosquito particularly bites in forests during the day and has been known as the forest day mosquito for this very reason. Depending upon region and biotype, there are differing active peaks, but for the most part they rest during the morning and night hours. They search for their hosts inside and outside of human dwellings, but are particularly active outside. The size of the blood meal depends upon the size of the mosquito, but it is usually around 2 microlitres. Their bites are not necessarily painful, but they are more noticeable than those from other kinds of mosquitoes. Tiger mosquitoes generally tend to bite a human host more than once if they are able to. 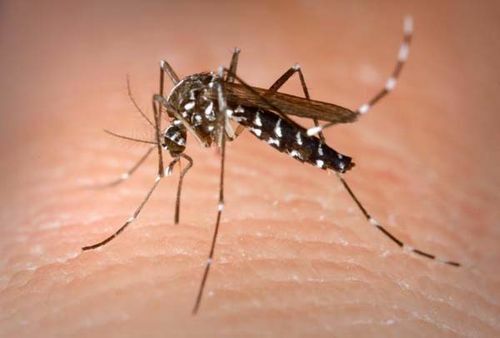 Aedes albopictus also bites other mammals besides humans; they also bite birds. The females are always on the search for a host and are persistent but cautious when it comes to their blood meal and host location. Their blood meal is often broken off short without enough blood ingested for the development of their eggs. This is why Asian tiger mosquitoes bite multiple hosts during their development cycle of the egg, making them particularly efficient at transmitting diseases. The mannerism of biting diverse host species enables the Asian tiger mosquito to be a potential bridge vector for certain pathogens that can jump species boundaries, for example the West Nile virus.